These are the awards that I am currently giving to other sites, take a look at the image, and the requirements and send me an email if you think that you're site would qualify for any of the awards. 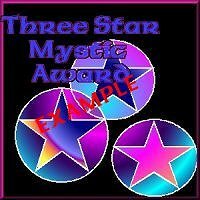 One of the requirements that I do have, you must place a link back to this site, either in the award image, or as a banner on your site. 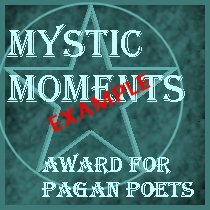 This award is to be given to sites that have pagan/wiccan/occult content, are easy to navigate, and display a tastefull use of graphics. As it states, an award for Origional poetry. I am a poet, and appreciate the willingness of others to share their work here on the net with others, poetry sometimes can be intensly personal, it's like having a peice of you in your words. And to put it up so anyone can view and appreciate it is something that I applaud. So if you feel that you want this award for your site, please feel free to drop me a line and ask for it. Otherkin, a subject much debated. 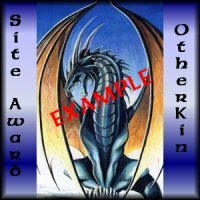 You don't need to be told the requirements to get this award, those that make the sites that deal with the otherkin will know.